King’s Jewelry And Collateral Loan Company Incorporated address, phone, website, hours of operation, and more. Located in Los Angeles, Calif., King’s Jewelry & Loan is family-owned and operated pawnbroker company in California. It has a team of more than 50 employees. Established in 1946, the company offers bargains on a variety of jewelry items. The company provides cash services for government, tax refund, personal, payroll and travelers checks. It accepts ATM card for purchases and loan payments. The company provides a variety of prepaid long distance calling and airtime cards. 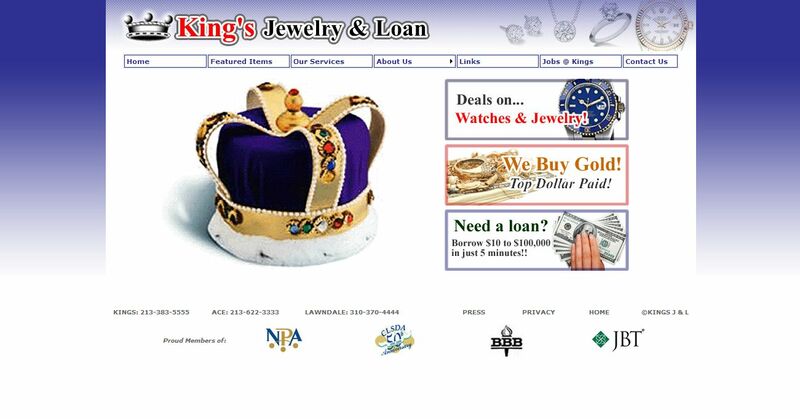 King’s Jewelry & Loan organizes Internet auctions and provides jewelry repair services. The company operates stores that sell rings, watches, earrings, bracelets and watches. It also provides jewelry-related educational articles for consumers. King’s Jewelry & Loan is a member of the National Pawnbrokers Association and the California Collateral Loan and Secondhand Dealers Association.